A couple nights ago, I braved the blinding snow to hit the CopperMine Pub’s monthly homebrewers meetup. There I meet up with some great local homebrewer’s including Robert Olsen. Bob has been brewing quite seriously of late gearing himself for a run at a brewery, Bolero Snort. On my way out Bob gave me a bottle of his Wee Heifer’s Fruitcake to try, which I’m really looking forward trying since his IPA from earlier that evening was frigging awesome! I must say before I even start drinking this brew, He’s got a great label! I love the Bull with the ring and the brew! But a beer is not made in the label, so back to the beer. 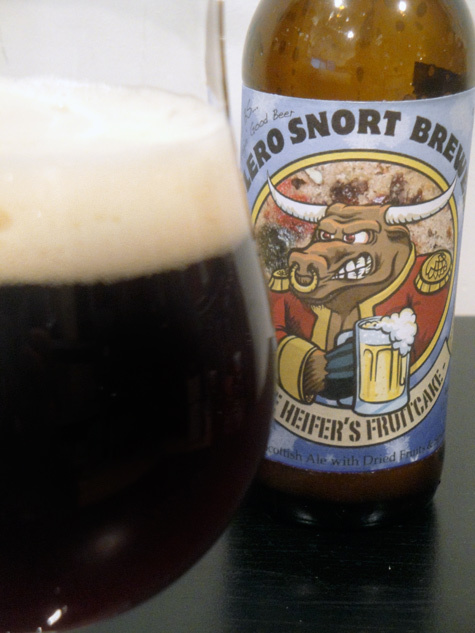 I started drinking the beer fairly cold and it was a bit too fruity for me with the raisins and figs dominating the flavor along with the perceived heat of the bourbon. 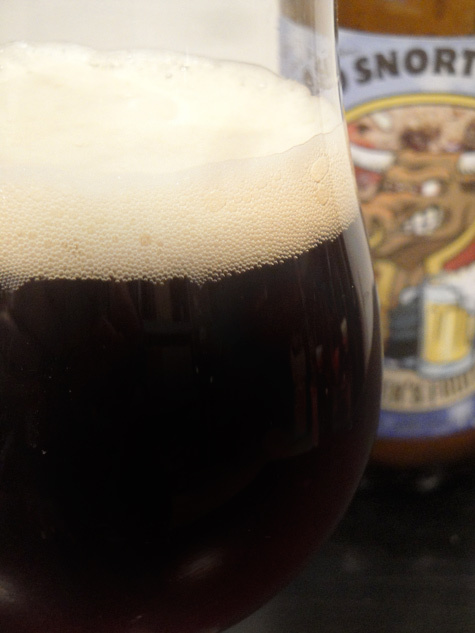 But, as this beer warmed up the bourbon, cherries, and figs all started to meld together with the malt from the base beer. This beer is growing on me really fast, I’m really enjoying the bourbon in this beer with the cherries and there’s a very pleasant spice in the aroma that really reminds me of fruitcake. My thought after finishing this brew, like the label says, I “wouldn’t dream of re-gifting this fruitcake”. With the quality of homebrews I’ve been drinking in New Jersey lately, I sure hope some of these guys, like Bob, join me in opening their own Breweries/Brewpubs and finally getting NJ the craftbeer status it deserves! Next story Announcing IRON BREWER Championship Round!